Being a mascot is a tough gig. You’re expected to be fully committed to the character while entertaining the crowd. Breaking character is a big no-no. Although, sometimes there’s a valid reason like when Herky the Hawk dropped to his knees after taking a football to the groin this weekend. 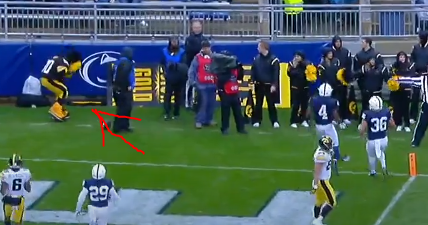 In Iowa’s weekend matchup against Penn State, in the first quarter, quarterback Nate Stanley got rid of a ball, throwing it to the sidelines. The ball took a bounce off the turf and nailed Herky right in the nards. Hopefully, Nerky gets hazard pay because that was an extremely unlucky bounce that happened to hit him where it stings the most. Unfortunately for Nerky, this kind of stuff is the risk of the job. I’m sure he quickly gathered himself and continued to entertain despite the clear sideline doink to the groin.